The 2013–14 La Liga season was the 83rd since its establishment. Match days were drawn on 9 July 2013. The season began on 17 August 2013 and ended on 18 May 2014 due to all top-flight European leagues ending earlier than the previous season because of 2014 FIFA World Cup. Elche, Villarreal and Almería competed in La Liga this year after spending the previous season in lower leagues. Atlético Madrid, Real Madrid and Barcelona traded the lead several times throughout the season. Entering the final weekend of play, Atlético Madrid were three points ahead of 2013 champions Barcelona. However, with the two teams facing off, Barcelona could claim the title with a win. The game ended in a draw, giving the Colchoneros their first league title in 18 years, and their tenth overall. It was the first time since the 2003–04 La Liga that a club other than Barcelona or Real Madrid, who finished second and third respectively, have won the title. Osasuna, Real Valladolid and Real Betis finished in the bottom three and were relegated. Cristiano Ronaldo won the La Liga Award for Best Player for the first time. As the top scorer with 31 goals, Ronaldo also won the Pichichi Trophy, along with the European Golden Shoe. Ángel Di María had the most assists, with 17. Thibaut Courtois won the Zamora Trophy for best goalkeeper. A total of 20 teams contested the league, including 17 sides from the 2012–13 season and three promoted from the 2012–13 Segunda División. This included the two top teams from the Segunda División, and the victorious team of the play-offs. 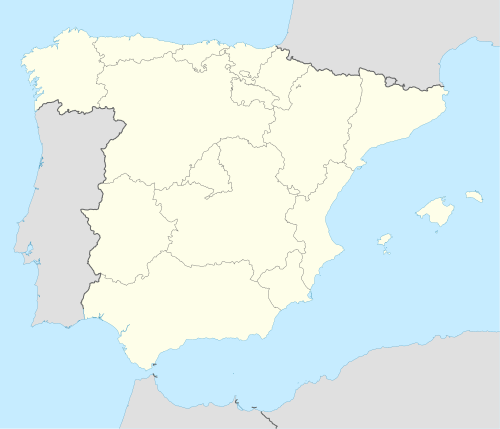 RCD Mallorca, Deportivo de La Coruña and Real Zaragoza were relegated to 2013–14 Segunda División the previous season: Mallorca were relegated after 16 years in La Liga, the longest period in its history and ending their golden era, Zaragoza returned to Segunda División after a four-year tenure in La Liga, while Deportivo made an immediate return to the Segunda División after being promoted the previous year. All three teams were relegated in the last matchday. The three relegated teams were replaced by three 2012–13 Segunda División sides: Elche CF returned to the top level as Segunda División champion after 24 years of absence and with the last 14 seasons consecutively in the Segunda División. The second placed team Villarreal was also promoted to La Liga making an immediate return to La Liga after a win over Almería in the decisive match of the last set of games where the winner would be directly promoted to La Liga. Almería returned to the Spanish top flight after spending two years in the Segunda by beating Girona in the promotion play-offs. This was the first season since the 1988–89 season without any teams from the archipelagos of Spain (teams located on the Balearic Islands and Canary Islands) since RCD Mallorca was relegated and UD Las Palmas failed to be promoted after playing in the promotion play-offs later season. Announcement date. The appointment was made effective since 1 July 2013. The 2013–14 La Liga season was the 83rd since its establishment. Match days were drawn on 9 July 2013. The season began on 17 August 2013 and ended on 18 May 2014. For the first time since 1951 and just the third time in league history, the La Liga title came down to a head-to-head match on the final weekend of play. Atlético Madrid were three points ahead of 2013 champion Barcelona, but had its final game on the road in Barcelona. Barcelona took a 1–0 lead into the half and Atlético lost two starters to injury in the half. A second half header, however, secured a 1–1 draw, earning the Colchoneros their first league title in 18 years, and their 10th overall. It was the first time since the 2003–04 La Liga that a club other than Barcelona or Real Madrid, which finished tied for second, won the title. It was also the first time in the 67-year history of the Camp Nou stadium that a visiting team had clinched the title in the stadium. The emergence of Diego Costa and Koke was a large part of Atlético Madrid's success. Costa scored 28 goals on the season (27 in league play), including the winner in Atlético's first victory over Real Madrid since 1999. Koke had 18 assists on the year (13 in league play), to go with seven goals. Earlier in the season, Lionel Messi scored a hat-trick as Barcelona ended a 31-match unbeaten streak for Real Madrid. The same day, Atlético beat Real Betis to claim the league lead. A loss against Levante and draw against Malaga left Atlético vulnerable heading into their final match. Cristiano Ronaldo won the league scoring title with 31 goals. Messi was second and Costa third. Ángel Di María had most assists with 17. Thibaut Courtois won the Ricardo Zamora Trophy for best goalkeeper. Barcelona was the least penalised team. ^ a b Since both the 2013–14 Copa del Rey champions (Real Madrid) and runners-up (Barcelona) qualified for the 2014–15 UEFA Champions League, the 5th, 6th and 7th placed teams will qualify for the group stage, play-off round and third qualifying round of the 2014–15 UEFA Europa League respectively. ^ a b c "Spanish La Liga Stats: Top Goal Scorers – 2013–14". ESPN. Entertainment and Sports Programming Network. Retrieved 19 May 2014. ^ a b c d e f g h i j k l m n "Spanish La Liga Stats – 2013–14". ESPN FC. Entertainment and Sports Programming Network (ESPN). Retrieved 18 August 2013. ^ "Mallorca, Deportivo de La Coruña y Zaragoza, pierden la categoría y descienden de la Liga BBVA" [Mallorca, Deportivo de La Coruña and Zaragoza, are relegated from Liga BBVA] (in Spanish). LFP. 2 June 2013. Retrieved 9 June 2013. ^ "Un líder absoluto y austero" [An absolute leader and austere] (in Spanish). El País. 18 May 2013. Retrieved 9 June 2013. ^ "El Villarreal es de Primera" [Villarreal is in the First division] (in Spanish). As. 8 June 2013. Retrieved 9 June 2013. ^ "La gran final por el ascenso" [The grand final for promotion] (in Spanish). El Mundo Deportivo. 8 June 2013. Retrieved 9 June 2013. ^ "El Almería cierra su triángulo mágico" (in Spanish). Marca. 22 June 2013. Retrieved 23 June 2013. ^ "'Nike Incyte', balón de la Liga BBVA la próxima temporada" ['Nike Incyte', Liga BBVA ball for next season]. As. 1 July 2013. Retrieved 1 July 2013. ^ "Pellegrini: "Tengo un compromiso con el City, espero que se ejecute"" [Pellegrini: "I have a commitment with City, I hope it will run"] (in Spanish). Marca. 29 May 2013. Retrieved 2 June 2013. ^ "Djukic no seguirá en el Pucela" [Djukic will not follow in the Pucela] (in Spanish). Real Valladolid. 30 May 2013. Retrieved 30 May 2013. ^ "Florentino Pérez: "Hemos llegado al acuerdo con José Mourinho de dar por finalizada la relación al término de la temporada"" [Florentino Pérez: "We have reached an agreement with José Mourinho to end the relationship at the end of the season"] (in Spanish). Real Madrid C.F. 20 May 2013. Archived from the original on 7 June 2013. Retrieved 21 May 2013. ^ "O Real Club Celta e Abel Resino acordan pór fin á súa relación" [Real Club Celta and Abel Resino agree to terminate their relationship] (in Galician). Celta de Vigo. 8 June 2013. Archived from the original on 11 June 2013. Retrieved 9 June 2013. ^ "Luis Enrique, new manager of Real Club Celta". Celta de Vigo. 8 June 2013. Archived from the original on 16 June 2013. Retrieved 9 June 2013. ^ "El Almería y Javi Gracia no llegan a un acuerdo de renovación" [Almería and Javi Gracia do not reach an agreement for contract renewal] (in Spanish). UD Almería. 28 June 2013. Archived from the original on 1 July 2013. Retrieved 3 July 2013. ^ "Francisco es el nuevo entrenador del Almería" [Francisco is Almería's new manager] (in Spanish). UD Almería. 29 June 2013. Archived from the original on 2 July 2013. Retrieved 3 July 2013. ^ "Valverde anuncia que se marcha y Djukic entrenará al Valencia" [Valverde announces that goes away and Djukic will train Valencia] (in Spanish). As. 1 June 2013. Retrieved 2 June 2013. ^ "Miroslav Djukic, new manager of Valencia CF". Valencia CF. 5 June 2013. Archived from the original on 16 June 2013. Retrieved 9 June 2013. ^ "Fin de contrato de Montanier" [End of contract of Montanier] (in Spanish). Real Sociedad. 21 May 2013. Retrieved 21 May 2013. ^ "Komunikatu ofiziala: Jagoba Arrasate Realaren entrenatzaile berria" [Official statement: Jagoba Arrasate, new Real Sociedad manager] (in Basque). Real Sociedad. 8 June 2013. Retrieved 9 June 2013. ^ "JIM, fin de trayecto" (in Spanish). Marca. 5 June 2013. Retrieved 5 June 2013. ^ "El Athletic no renueva a Marcelo Bielsa" [Athletic do not renew Marcelo Bielsa] (in Spanish). Marca. 29 May 2013. Retrieved 2 June 2013. ^ "Primera Liga: Real Betis sack head coach Pepe Mel". Sky Sports. 2 December 2013. Retrieved 2 December 2013. ^ "Garrido, destituido (Garrido, sacked)". Marca. 19 January 2013. Retrieved 19 January 2013. ^ "Calendario Liga BBVA 2013/14" (PDF). LFP. 9 July 2013. Retrieved 9 July 2013. ^ "Proyecto de calendario para la temporada 2013/14" [Calendar proposal for 2013–14 season] (in Spanish). LFP. 6 June 2013. Archived from the original on 9 June 2013. Retrieved 9 June 2013. ^ Michael Yokhin (16 May 2014). "Last day drama in Spain". ESPN. Retrieved 19 May 2014. ^ a b c Joseph Walker (19 May 2014). "The 10 key factors in Atletico's title glory". ESPN. Retrieved 19 May 2014. ^ a b "Spanish La Liga Stats: Assists Leaders – 2013–14". ESPN Soccernet. Entertainment and Sports Programming Network (ESPN). Retrieved 19 May 2014. ^ a b "Zamora Trophy 2013–14". Marca. Marca. Retrieved 19 May 2014. ^ "Spanish La Liga Stats: Team Discipline – 2013–14". ESPN. 19 May 2014. Retrieved 19 May 2014. ^ "Lionel Messi scores hat-trick in Barcelona win". ESPN. 2013-09-01. Retrieved 2014-05-20. ^ "La Liga Highlights: El Hamdaoui Hat-trick for Málaga vs. Rayo". Insidespanishfootball.com. 2013-09-15. Archived from the original on 20 May 2014. Retrieved 2014-05-20. ^ "Rayo Vallecano 0–4 Barcelona: Pedro hat-trick seals Blaugrana win". Goal.com. 21 September 2013. Retrieved 19 May 2014. ^ "Cristiano Ronaldo scored his 22nd hat-trick for Real Madrid against Sevilla but still Lionel Messi and Pele lead the way with trebles". Sport.net. 2013-10-31. Retrieved 2014-05-20. ^ "Youssef El-Arabi inspires Granada to win over Malaga". Sports Mole. Retrieved 2014-05-20. ^ "Cristiano Ronaldo Hat Trick Against Real Sociedad (GIF)". Complex. 2013-11-09. Retrieved 2014-05-20. ^ Abnos, Alexander (2013-11-23). "Mexico's Carlos Vela nets four goals in Real Sociedad comeback victory | Planet Futbol". Sports Illustrated. Archived from the original on 20 May 2014. Retrieved 2014-05-20. ^ "Rayo Vallecano 1-4 Espanyol: Sergio García hat-trick punishes ten men of Rayo". InsideSpanishFootball.com. 24 November 2013. Archived from the original on 20 May 2014. Retrieved 20 May 2014. ^ "Jonas treble sinks Osasuna". ESPN. 1 December 2013. Retrieved 19 May 2014. ^ "Valladolid tops Celta Vigo behind Guerra's hat trick". Fox News. 2013-12-16. Retrieved 2014-05-20. ^ "Líder sin defensa" [Leader with no defense] (in Spanish). Marca. 22 December 2013. Retrieved 19 May 2014. ^ "Barca 4-0 Elche: Sanchez hat trick". Goal.com. Retrieved 2014-05-20. ^ 7 January 2014 Time: 07:35 am (2014-01-07). "Ikechukwu Uche scores hattrick for Villarreal". Kick Off. Retrieved 2014-05-20. ^ SOCCER (2014-02-28). "Aduriz hat trick leads fourth-place Bilbao by Granada". Sports Illustrated. Retrieved 2014-05-20. ^ "Lionel Messi Becomes Barcelona's All-Time Top Goalscorer". Huffington Post. 2014-03-17. Retrieved 2014-05-20. ^ AP 6:55 p.m. EDT March 23, 2014 (2014-03-23). "Messi's hat trick gives Barcelona win at Madrid". USA Today. Retrieved 2014-05-20. ^ Rigg, Nicholas (28 October 2014). "Atletico Madrid snubbed at La Liga awards despite winning league ahead of Spanish giants Real Madrid and Barcelona". The Independent. Retrieved 8 March 2016.